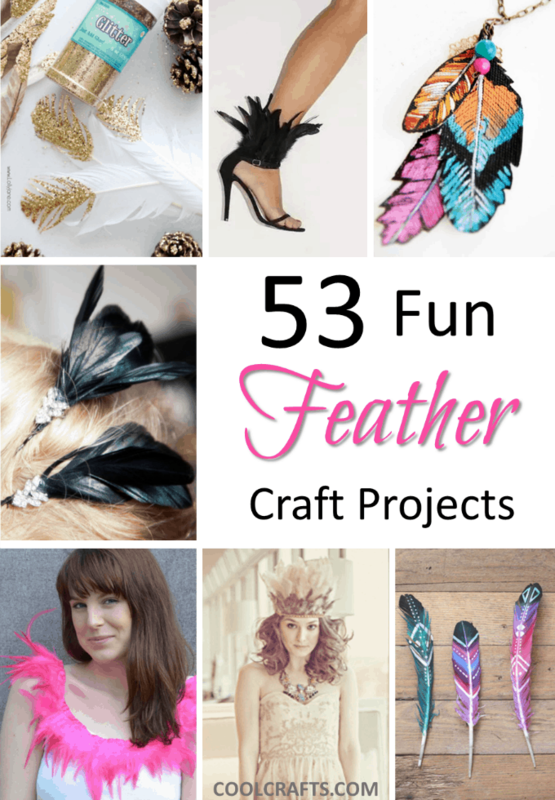 We know that feathers alone are pretty ‘fun’, but the following 53 DIY craft projects will add a whole new meaning to this word. From whimsical headdresses and feathered stilettos to peacock feather ornaments and intriguing wall art (just to mention a few), this list of feather-related tutorials are sure to get your wings flapping! It’s time to stock up on some feathers from your local craft store…and don’t forget the glue! These colorful feather boutonnieres are both eye-catching and extremely personal, as the bride (Elsie from A Beautiful Mess) created these herself for the groomsmen to wear. Check out the tutorial on 100 Layer Cake! Love the feather look but would prefer not to work with real feathers? (Perhaps you’re allergic?) Alisa Burke has you covered with this faux feather necklace tutorial featuring beautiful, hand-painted feathers. Now, isn’t this DIY craft project by A Pair and a Spare quite fancy? If you want to add some va-va-voom to your favorite pair of heels, you can do so by following this step-by-step guide! This feathered shrug was made by the talented Bettsy Kingston for her sister’s graduation and doesn’t it look fabulous?! You too can make your own by following her instructions. You’re going to love this simple and fun hanging decoration by Bottomley Cottage, featuring pretty lace and eye-catching feathers! This would look perfect in a nursery or even your own bedroom. We’ve seen many beautiful headdresses in our time, but none quite as whimsical and glamorous as this one by B Posh Photo! You’ll certainly want to check out this wonderful tutorial to create your own version. These faux leather feather earrings are incredibly unique and you’ll love their gold-tipped design! Take a peek at this crafty tutorial from Brit + Co to find out just how simple these are to create! It’s amazing what you can do with a plain glass ornament and Changing My Destiny is here to show us that you can also incorporate peacock feathers into your Christmas adornments. This is a genius idea! Adding feathered trim to a plain white tank top is as easy as 1, 2, 3 thanks to this amazing DIY tutorial from Clones n’ Clowns. Remember, you can customize your look with any color or type of feathered trim that your heart desires! These feathered pens bring back fun memories from our childhoods, so you’ll definitely get excited about this simple project idea from Cori Ann’s Creative Living. These pens are so colorful that they’re sure to add some cheer to your dreary office day! We kid you not, it’s an edible feather tutorial from Cup a Dee Cakes! Follow this step-by-step guide to create your very own feathers from edible (and delicious) ingredients. Are you stuck in a jewelry rut? 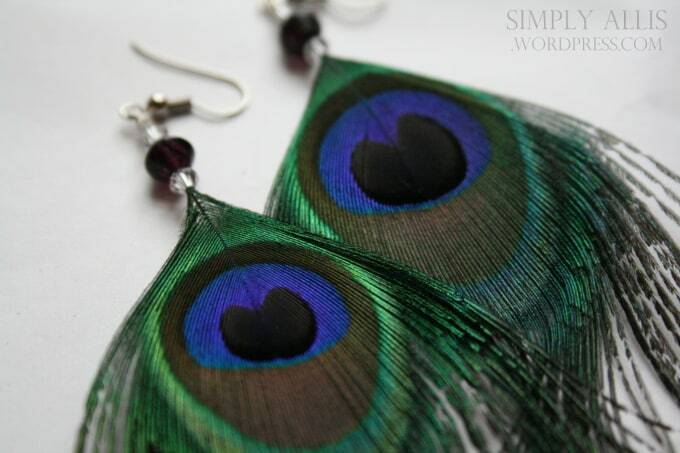 Look to this wonderful tutorial from Cupcakes and Crinoline to show you how you can quickly create a new set of earrings which look like fashionable feathers! We adore these Cupid’s arrows from none other than the talented Design Sponge! These would be a fun addition to a Valentine’s themed party, or even as a decoration around the home. This simple angel wings tutorial by Erin Archer was so amazing that it was even featured on Lauren Conrad’s website! Next time Halloween rolls around and you have no idea what to wear, think back to this tutorial! This unique and fashionable DIY project incorporates feathers and gold with the humble hair grip. Follow this tutorial from Fall For DIY and you’ll have a snazzy new hair accessory that you’ll want to make more than one of! How amazing are these feathered doll dresses by Fashion Doll Stylist? Young girls are sure to love these fun designs and adults are certainly going to have a lot of fun making them! Combine two of craft’s favorite materials, washi tape and feathers, and you’ve got yourself an awesome print, just like this one by Fawn and Feather! The good news is that you too can easily create this masterpiece. You’ve probably seen blinged-up feather fans just like this one in stores, so why not get crafty and make your own within an afternoon? Flo Foxworthy has a wonderful tutorial for you to follow! 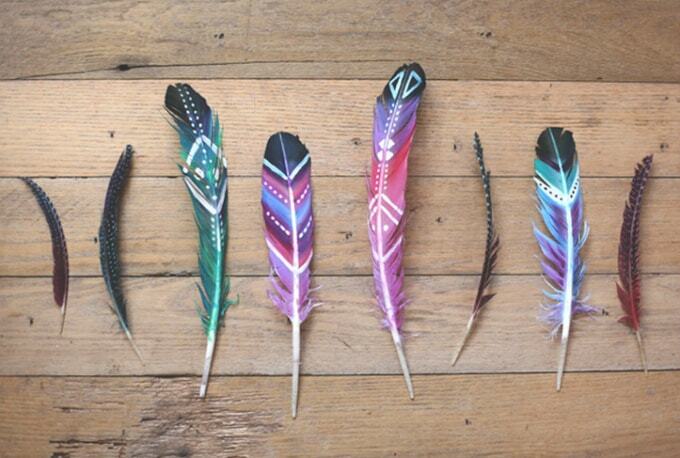 The Free People blog is the go-to place for bohemian-inspired DIY projects and you’ll be as pleased as punch to learn how to create your very own painted feathers. Take inspiration from Native American Indian culture when dreaming up your designs. This guinea fowl feather hair clip from Go Make Me is incredibly beautiful, so you might want to make a handful, rather than just one! Follow this step-by-step guide and you’ll have a wonderful new hair accessory in no time. It isn’t unusual to find magpie feathers left on your lawn or hidden among your garden, but the good news is that you can actually turn them into something amazing. Happiness Is Homemade shows you how to create these metallic feathers which are perfect for decorations or adding to your home décor. Add some fancy feathers to your space to bring a little nature indoors! This DIY craft project from How Did You Make This will show you how. This homemade wreath from Infarrantly Creative will look like a masterpiece hanging on your front door! Find out how this talented crafter created it by following her informative guide. It’s another gem of a tutorial from Infarrantly Creative and this time the blogger shows you how to create a realistic looking feather using string and some paint! This is also a fun project for kids to tackle on a rainy day. 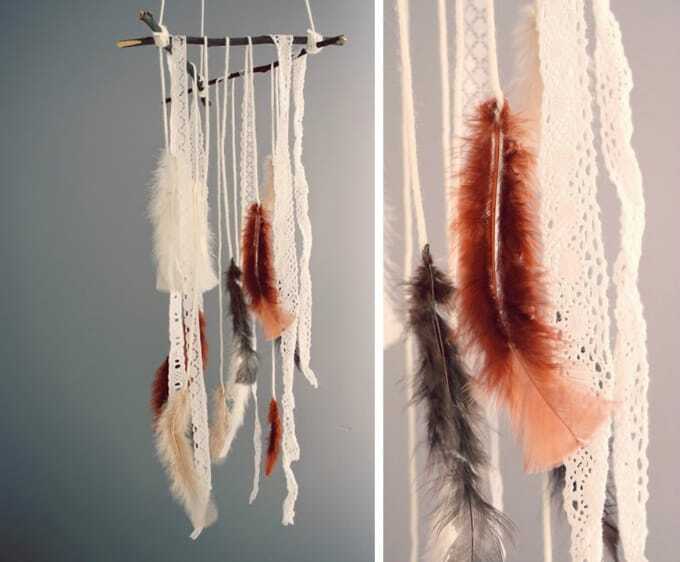 Dream-catchers are popular for a reason, but have you ever seen one adorned in dip-dyed feathers? This is a wonderful idea from Into Mind that you’re sure to love! These faux leather feather necklaces are incredibly pretty and we love how they’re teamed with chains, pendants and beads to create a truly unique look! Check out this tutorial from Kirsten Nunez via eHow to see how she created these. How cute are these little toothpick feathers by Kvinnan? While it’s an awesome way to add some pizzazz to your toothpicks for a dinner party, these could also serve as fun embellishments to glue onto cards, wall prints or anything else you can think of!